We produce skirting for tables, counters, stages and any other custom application you might require. There are three styles of pleat that we offer. We can produce any width (length) size you require up to a maximum height. 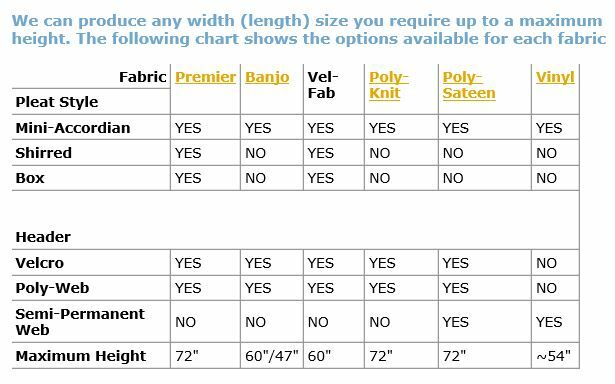 The chart below shows the options available for each fabric. 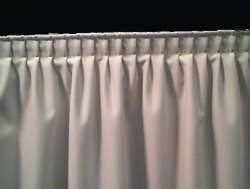 This is the typical tradeshow style pleat where the distance between pleats is 1". It yields a fullness of about 1.5 to 1. 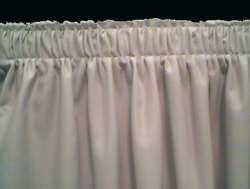 This is the most common style of banquet quality skirting where the pleats are actually a continuous gather. It yields a fullness of about 2 to 1. 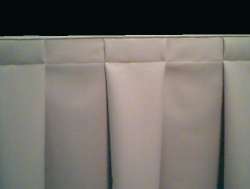 The highest quality pleat most often seen in the best hotels. Individual 3" "boxes" of clothline up down the skirt. It yields a fullness of about 2.5 to 1. 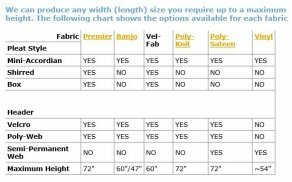 Skirt Chart: Size, style, and fabric.